Customized stationery will complete your printed package. 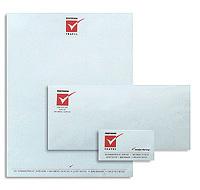 We provide letterhead, envelopes, business cards, note cards, Rolodex cards and self-adhesive labels. 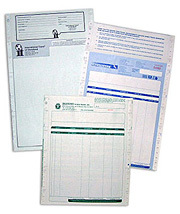 A wide variety of paper stocks, including recycled paper, are available. Our in-house art department will reproduce your logo to your specifications, and our representatives will advise you on choices including materials, quantity and delivery. Interested in placing an order? For products that are customized with your company information on it, you can request an order to be placed on our website. Simply click here to Request an order or request a quote. Dataguide's checks and statements can accommodate whatever system you run in your office. All forms can be customized to coordinate with the rest of your company's printed matrials. 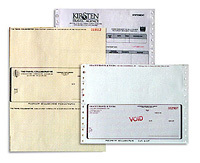 Checks and statements are laser or continuous feed, can be printed in your company's color(s) with your logo, and are available in a variety of paper stocks. Invoices and Itineraries are important forms for any travel business. They can be part of your promotional marketing program too. Itineraries featuring your company name and logo are a constant reminder to your customer of the source of his or her travel plans. And that's only the begining. Dataguide's customized forms can accommodate all of the information and design elements you require. The design you choose can be uniquely yours. Our continuous feed multi-part forms utilize the highest quality paper and printing processes; your logo in one, two or three colors, can be reproduced perfectly. 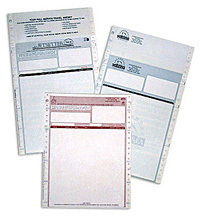 We also offer custom forms that are laser compatible. All invoice/itineraries from Dataguide are guaranteed to work on your system. Customized features on Dataguide's invoice/itineraries include the use of "filler strip" space, which is the three inch removable section at the top of many forms (depending on the printer you use). We offer a booklet of standard "filler strip" options you can choose from, or we can assist you in designing your own. In addition, our invoice/itineraries can be further coordinated for use in unique ticket packaging options (for more information see Packaging). • Premium white top copy paper so your printout is crisp and easy for your customer to read. • Protect yourself with our "Standard Industry Disclaimer" printed on the back of any or all plies at no extra cost. • Choose one to four color printing to create a unique image all your own. • Simplify your internal filing system using designating words for each ply or choosing from multiple paper colors to create your own sequence. • Standard form sizes 8.5" x 11" or 8.5" x 14". Alternative sizes are available to meet your needs. • Over 20 filler strip options available for 14" forms at no additional cost. • Various print formats available to fit your reservation system; customize your own to best meet your needs. Features: Premium white top copy paper so your printout is crisp and easy for your customer to read. The Travelpak transforms the last ply of a multi-part invoice/itinerary form into a pocket for your customer's tickets. The itinerary prints on the face of the Travelpak and when folded up, it becomes a durable delivery packet. Meanwhile, the amount of space permitted by a three-panel exterior enables you to present custom information more efficiently and effectively. 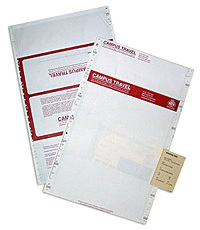 Travel Covers are similar to Travelpaks, with the cover making up the last ply of the itinerary. The Travel Cover is made of 33-pound paper. The itinerary is printed on the inside and the airline ticket is stapled into it. Once folded, the durable paper becomes the Travel Cover. In addition, the three outside Travel Cover panels can be customized to display whatever message or important customer information you choose. You've made the arrangements, you've booked the flights, and you've met the customer's timetable and budget. The paperwork arrives. You assemble it and insert it- into a package with someone else's name on it! Take the credit you deserve for your hard work and promote your business at the same time with affordable custom ticket packaging. 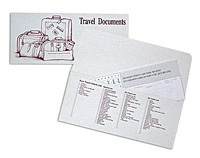 We feature several design options for packaging all of your customer's travel documents. They are as practical as they are unique. And they can open the door to identifying your company as the source for travel planning. 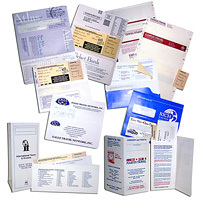 Your choice of Travel Covers, Travelpaks, Ticket Caddies, Airline Style Ticket Jackets or Document Folders. A custom ticket package offers one more opportunity to market your company. 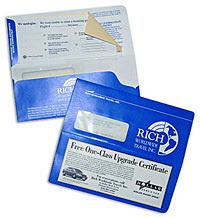 The Ticket Caddy offers several packaging features, including a unique tab for securing tickets and optional windows. An upgrade from our standard paper stock to a coated paper stock enhances your custom graphics and creates a professional appearance. Document holders are made of durable paper and are large enough to hold passports, visas, receipts, cruise documents and more. Available in quantities as low as 150 pieces. Click Here for more details. Customized stationery will complete your printed package. 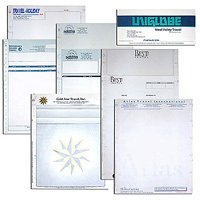 We provide letterhead, envelopes, business cards, note cards, Rolodex cards and self-adhesive labels. 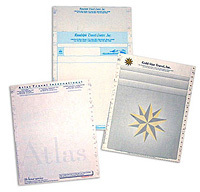 A wide variety of paper stocks, including recycled paper, are available. Our in-house art department will reproduce your logo to your specifications, and our representatives will advise you on choices including materials, quantity and delivery. Click here to order travel agent supplies.